Unit 4 is perched amongst a canopy of oak and birch trees - you can stand on the balcony, reach out, and touch leaves and branches over 2-stories from the ground! 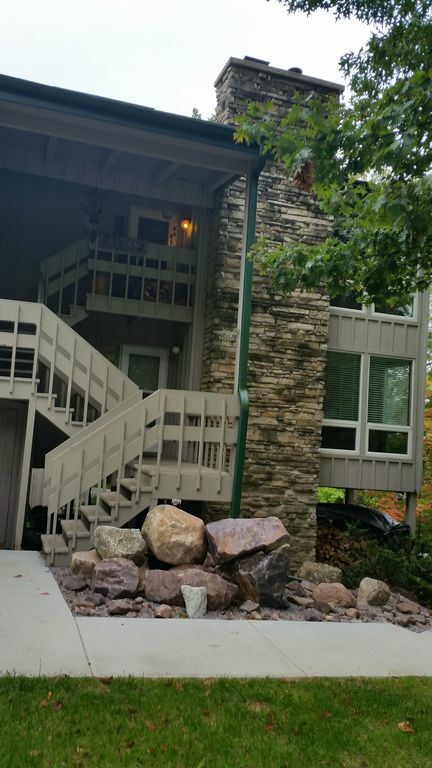 Unit 4 is one of eight condominiums in a building nestled amongst a mature birch/oak forest with views over the Lake Wisconsin valley. Casual, whimsical, bright furnishing. Italian ceramic floor in bath and kitchen. New step-in rainfall shower. Woodburning stove insert in the original, beautiful, stone fireplace. Small firepit outside for quiet summer/fall eves; or hearty-folks roasting s'mores in winter. Lovely, oiled-teakwood laminate floors LR and Hall - carpeted bedrooms. You may find yourself resting on a pillowcase embroidered by my Cornish grandmother; or snuggled under a quilt made of squares of men's suit material; or find pencil drawings sent to Cornwall from the trenches of WWI...poke about...little surprises all over. AND...and whole bass fiddle case of books! Wildlife sightings - deer, turkey, raccoon, owl, and birds of all sorts fly over or walk through these remarkable surrounds. Marvelous earthrise and earthsets. I think the trees up here talk. Parfrey's Glen official entrance is a 20-minute walk away. Devil's Lake is a 10-minute ride. Devil's Head Ski/Golf Resort is 200 yards down Bluff Road. Quaint Merrimac FREE ferry (seasonal). Cascade Mountain Ski/Snowboarding or Wollersheim Winery/Sauk City - 20-minute ride. Attraction notebook available in unit. Plenty of QUIET. Noise restriction after 11p. You could write your book here! Remarkable views. Friendly condo neighbors. Comfy in the living room - fireplace blazing nearby and watching something wonderful on PBS...probably the Dicken's series...what teriffic tear-jerkers! How could I NOT have fallen in love with this place!? (I didn't mean to...it was a first project for me/my chef brother.) Although not a skiier or golfer, I AM a walker and I just step out the door and I'm nearly in the woods...AND stepping out on the balcony puts you eye--level with tree tops. Only squirrels, cranes, turkey vultures, and lovely little birds get a better view. New convertible rain shower...no longer a tub. PLENTY of towels. The proper entrance to Devil's Head Ski and Golf Resort is just down Bluff Road about 300 yards...AND...guests can actually walk through woods to one of the runs from here. ok...maybe NOT mountain, exactly, but bluffs...smack within the Baraboo Bluffs. Our gift from the great glaciers which carved out this area and left bluffs as their reminder of power & transformation. One each in LR and both bedrooms. Baseboard electricity...building built when electricity was 2 cents a watt...or close to...LOL. ...WAY many in the cupboard...including blankets for cold winter nights. Two HE washers in the common basement. We require that HE detergent 'doses' be used. (2) Two. Shared. In the basement. Coin-operated. $1 in quarters per session. Rebounder, Total Gym, and Gazelle in laundry room...ask, however, about guidelines IF you want to use them. Woodburning insert tucked in the beautiful original stone fireplace. See photos for the stock of wood...I'll bring some up for you and give you the short lesson about using the woodburner...NO flue! One REALLY comfy chaise and two chairs with hassocks...and, of course, the usual couch...quite comfy for sleeping one person...NOT a sofa-sleeper. My brother is a chef...it's a buffet toaster from one of his trade shows. Fun. Lots of condiments, herbs, spices in stock. Oatmeal and teas usually ready for use. WAY many...this is stocked more like a friend's house would be. 4 comfortably...6 if friendly and thin elbows. HDTC conversion channels only...includes PBS...yay! Is a Bose considered a 'stereo?' Got one...a few years old so apparently doesn't have an interface for some current phones/players. Family friendly videos - exercise tapes, Hook, some SciFi, and more. Great for bluff and forest watching - sipping coffee in the morning...NOT for BBQing. Very cute place and the hiking is exceptional in the area- Parfrey's Glen, Baxter's Hollow, and the Ice Age Trail- we will be back!! Lovely accommodations. Fireplace was a huge hit. Highly recommend. AND snow came tumbling down for your stay! My wife and I came up for the weekend, and we were very happy with the Rocky Glen Condo. The fireplace was warm on a cold weekend. The kitchen is nicely appointed, and we couldn't ask for more. Thank you to Lesliegh for everything, we will be back! Cozy and Comfy with Outstanding Ambience! We really enjoyed our stay in the Rocky Glen Condo. Comfy beds, super well stocked kitchen items, nice layout and area to lounge and chat with another couple we traveled with. The fire-thing (pot bellied-type fireplace insert) put out great warmth and added to our weekend (which was cold and snowy). Lesleigh was a great owner, from our initial Greeting Tour and always readily available to answer our questions or suggest a hike (we took the Ice Age Trail Meadow Hike and also visited Parfrey's Glen). The books, art, curios and overall feel of her place add to the overall wonderful vibe of the place. We'll return! Lesleigh was a pleasure to deal with. The place was clean, cozy and had everything for a comfortable, home-like stay. Thank you, Lesleigh!